I know a LOT about minimalist kitchen essentials, y’all. I’m not just preaching to you from a big fancy kitchen with lots of storage, telling you how minimalism in the kitchen is my goal. Nope. When you have lived on the road using a kitchen that is super tiny, then you really get to know about creating a minimalist kitchen! 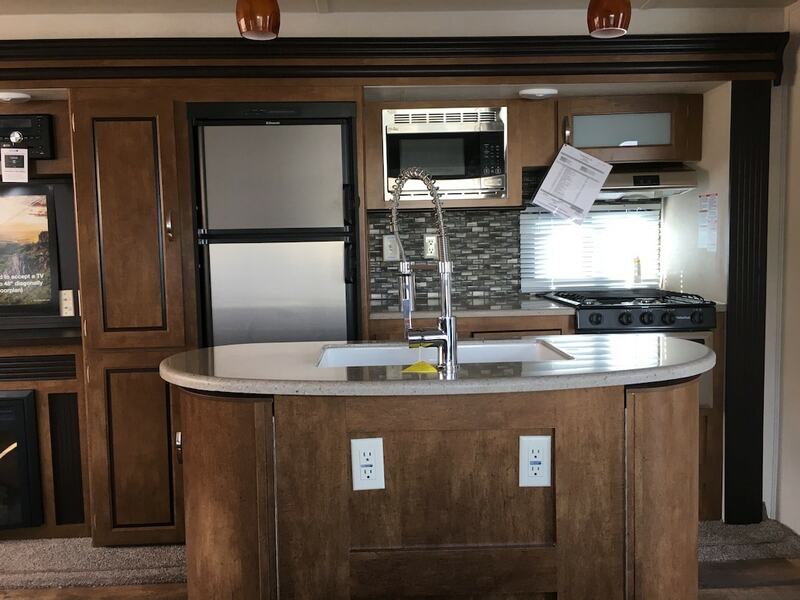 But this is NOT a blog post about how to create an RV kitchen. So stay with me. 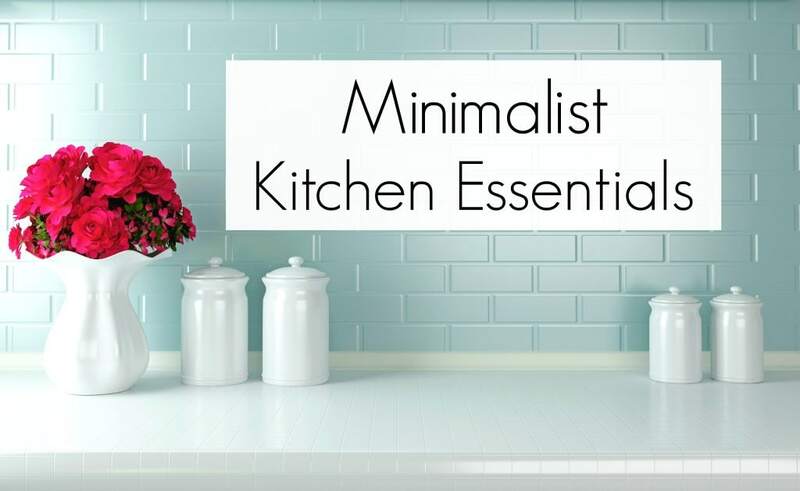 I’m using my example of a super small kitchen to show you how to create a minimalist kitchen wherever you live. I RVed across America for a year in a 33 foot travel trailer. Living in an RV full time means you have to do everything that you normally do in your own home, but in a much tinier space! Which, of course, means cooking and eating. We didn’t have the luxury of being on vacation every day, going to restaurants or ordering Uber Eats if we didn’t have enough food in the house. Instead, I found myself cooking more than I ever did in my normal home. We once relied on eating out and pizza delivery too much for our meals. Once on the road, I had to make sure I planned for every meal and had everything we needed. Because trying to find a grocery store or kitchen essentials when you’re out in the middle of a National Forest isn’t always so easy (okay, it’s NOT easy at all). It’s ironic: the smallest kitchen that I ever had was the one that absolutely had everything that I needed. Shelves on the end of the kitchen island. And you know what? I didn’t even use all of the storage to the best potential. I never got around to putting in shelf organizers or fancy systems. We could have fit in more stuff than we actually brought. In fact, we had TOO much stuff in the kitchen. I ended up taking a lot of kitchen gadgets and supplies out and putting them in storage. Today, we’re still in a transition phase. We’re not living in an RV anymore, but all of our stuff is still in storage four states away. We’re renting a fully furnished condo. But people’s expectations of what “fully furnished” means tends to vary when it comes to kitchen essentials. We have found that out! So while I’ve found myself once again trying to make do with a very minimalist kitchen, I’m also reminded of what’s missing and what I had on the road that is weirdly missing from the large kitchen! While our kitchen now is roughly the size of what our living room, kitchen and dining room combined was in our RV, it’s not any better. A lot of our storage space is taken up with useless items that we have to keep because it’s part of the house, but we’ll never use. I literally have storage cabinets full of kitchen appliances and supplies that will never be used by us. Things like toasters, a tea kettle, a coffee maker, two large glass salad bowls and pots and pans that are rusted and disgusting that I would never cook with. So, to keep those items, I’ve had to give up half of the cabinets just to store the stuff. Along the way, I’ve had to buy a lot of kitchen essentials that are not supplied in our rental home. More than once I’ve been in the middle of making dinner, when I realize that a very basic kitchen item is no where to be found in our kitchen. Which has led me to realize that I had a really great minimalist kitchen essentials list before. I had everything that we needed. It doesn’t matter if you have a tiny kitchen or a large kitchen. The kitchen supplies basics are always the same. I always pick the most non-toxic items available for my kitchen. Usually stainless steel or glass. In my free 3-Day Home Detox Email Course, many of the action items are how to clean up your kitchen for a healthy home. So I’m sharing my minimalist kitchen essentials list with you. Keep in mind, things can change a little based on your own unique situation. But at the same time, you don’t need a LOT of stuff in the kitchen to make healthy, delicious foods for your family. Two cutting boards (one for meat, and one for everything else) We actually use cutting boards as serving trays, too, so get a really nice cutting board for double duty. 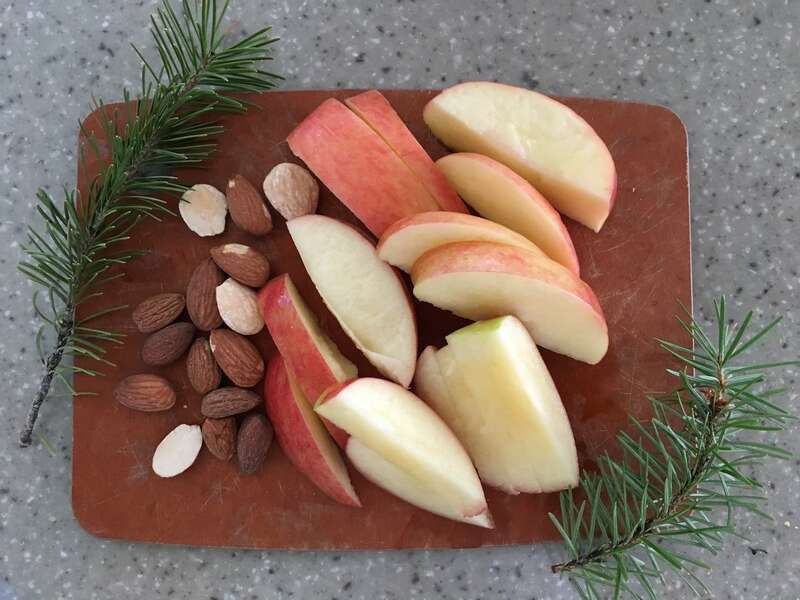 Our small cutting board with snacks and fresh pine branches for decorations from a National Forest in Idaho. Water filter pitcher (or faucet attachment) This is a non-negotiable in my minimalist kitchen. You MUST have safe, fresh drinking water above any other concern. Not only do many water filter pitchers remove lead from drinking water, but you can get them in all shapes and sizes (I even found a water pitcher that fit in our small RV refrigerator). This is where things get personal. A coffee maker isn’t on my list, but could be on yours. If you make amazing smoothies every morning, then have a really great blender. Own what brings you joy every day. 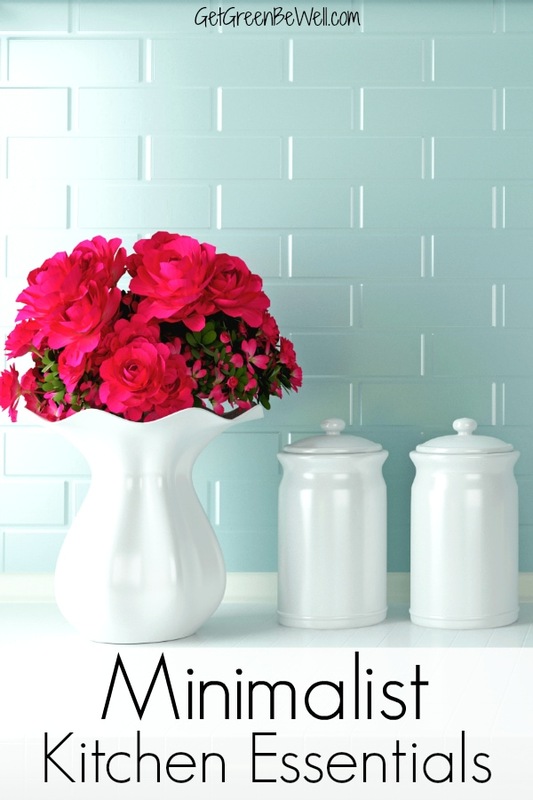 The best tips to create a minimalist kitchen is to always, always think about the best storage plan. Because you can still have a lot of kitchen supplies and still feel like you have a minimalist kitchen. If everything has a place to go for a neat and tidy clean up, then your kitchen will always have a clean minimalism feel. Even if it’s a large kitchen and you keep a lot of kitchen essentials. Kitchen supplies should stack within each other or collapse down. All of our pots will nest within each other. Which means I only have to find storage space for the biggest pot, not ALL of the pots and pans. The mixing bowls and storage bowls stack on top of each other or nest within the largest one. What you use most should be most accessible. We use kitchen spices a lot. Rather than hiding them in a kitchen cabinet, we put them in a drawer right by the stove to easily pull out. I use cutting boards and glass storage bowls almost daily. So they are in cabinets and drawers within easy reach of where I work. Don’t make things more complicated by storing kitchen essentials where they “should” be kept, or tucking them behind stuff you never use. Bring your most-used items to the front of every cabinet and drawer and push the stuff you barely use to the back (keep reading to see why). 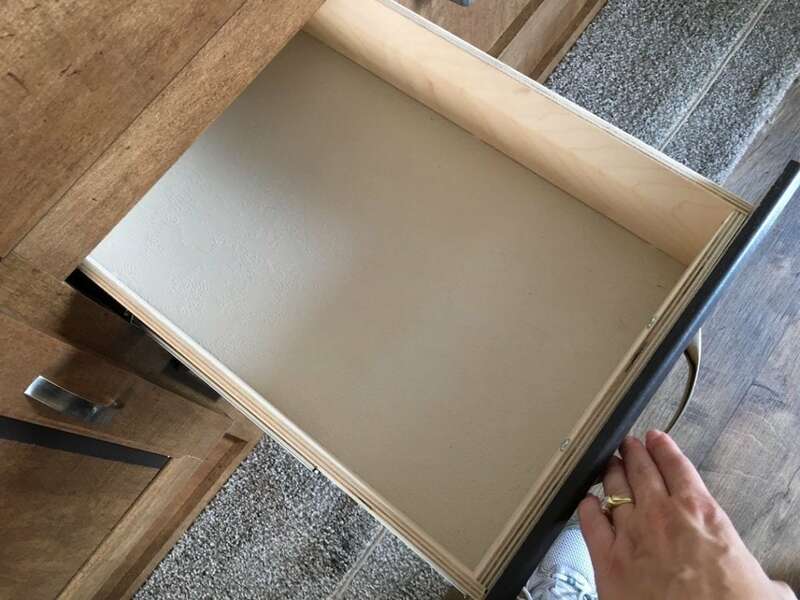 Use space saving cabinet storage ideas. 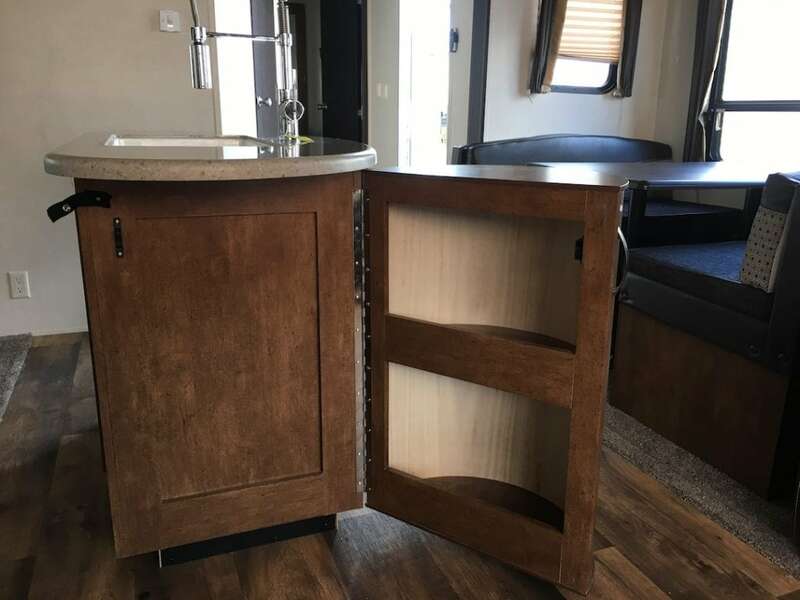 We used removable shelves in our RV kitchen to double our storage space. Unless you have stackable items that take up the entire height of a kitchen cabinet, there is just no reason not to maximize your kitchen storage space and double your amount of storage. I absolutely LOVE these expandable stackable kitchen cabinet shelf organizers! They are great because they have a flat surface, which makes stacking things on top of them easier than the wire shelves. Always use a cutlery tray. Knives, spoons and forks jumbled up in a drawer is a source of frustration. And can be unsafe. A cutlery tray will let you easily find what you need, and alert you to when you are about to use your last spoon. An expandable utensil organizer lets you maximize every last inch of your drawer without giving up any space. Do a kitchen inventory. Every few months, just take a moment to peek through your kitchen cabinets and drawers. Do you even know what’s in the back of your cabinets or lurking on the shelves under the counter? If you are surprised at what you find, then obviously you haven’t used it! Donate the stuff right now, or at least box it up and put it in the garage. If you don’t miss it after 6 months, donate it with a happy heart. Need some help getting organized? Our 30 Day Declutter Plan for a Healthy Home shows you how to detox and declutter your home for your family’s health. Borrow, buy or rent what you rarely need. I think I used my roasting pan once in the 12 years before we packed everything up to RV. Do you know how much space a roasting pan takes up in your kitchen??? I’ve found that there are a LOT of things usually in a kitchen that are used only once or twice a year. You don’t need to be giving up precious cabinet space for items that are barely used. Borrow what you need from family or neighbors when you need it. Rent tons of dishes and cutlery if you’re hosting a party at your home. Or buy what you need when you need it (inexpensive items such as pans or basic appliances), then donate it to charity afterwards. « Does Activated Charcoal Kill Mold? When we did our kitchen remodel, I had to learn how to cook with little – and it worked. Like you said, you find what you really need and go from there.